Besides the Grand Canyon West Rim tour from Las Vegas, there is another tour (that also departs from Las Vegas) that can provide, in my opinion, even better views of beautiful ecological and natural rock formations – the Death Valley day tour from Las Vegas. Death Valley is a desert valley located in Eastern California. Situated within the Mojave Desert, it has the lowest and driest locations in North America, and the hottest location in the world. 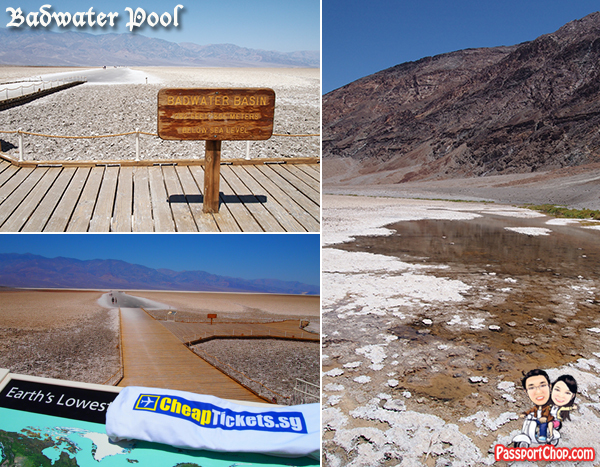 Badwater Basin, located in Death Valley, is of the lowest elevation in North America at 282 feet (86 m) below sea level. This is perhaps one of the reason that most people have termed the Death Valley the land of the extremes and you wouldn’t want to be stuck in the Death Valley alone with no water and food – The hottest air temperature ever recorded in Death Valley was 134 °F (57 °C) on July 10, 1913, at Furnace Creek, which is currently the hottest temperature ever recorded in the world! There are 2 main tours to the Death Valley from Las Vegas (which you can book from Viator) – a cheaper option at USD 199.99 at http://www.partner.viator.com/en/11499/tours/Las-Vegas/Death-Valley-Day-Trip-from-Las-Vegas/d684-3153DTHVALLEY or the USD 243.99 at http://www.partner.viator.com/en/11499/tours/Las-Vegas/Death-Valley-Explorer-Tour-by-Tour-Trekker/d684-3533DEATHVALLEY. 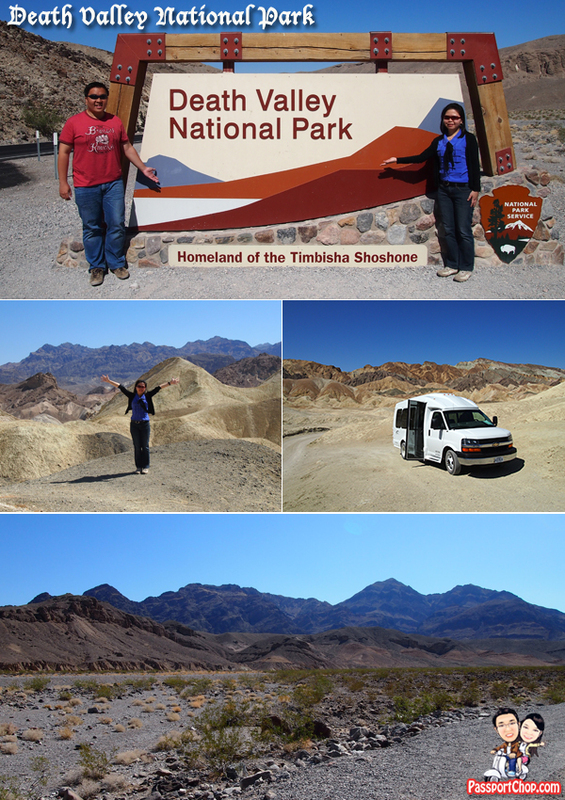 We took the USD 199.99 Death Valley tour (from Las Vegas) and it was ok – the tour covered quite a bit of Death Valley and the guide – Ralph was great with his stories about history and geography of California and Death Valley. I believe the key difference between the 2 tours is that the more expensive version has a smaller group size (judging from the jeeps they are driving and they do not cover Scotty’s Castle so you might get to see more natural geological formations in Death Valley (not sure about this though)). 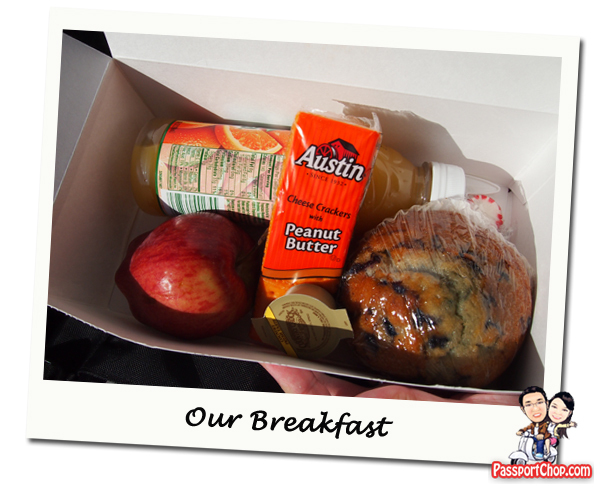 Our Death Valley adventure began with a complimentary continental breakfast in Beatty, Nevada, your first stop in the Mojave Desert – it was actually a boxed meal comprising a muffin, apple, peanut butter cheese crackers and a bottle of orange juice so you can have it on the road – not bad as it saves us some time and we can get straight to seeing the sights in the Death Valley. Our tour group comprised of 6 persons and we were driven around in a minibus which offered much more flexibility than big tour group coaches in the places we can explore in Death Valley. This tour lasts for about 11 hours and there are stretches of long drives of about 1-2 hours – however, Ralph, the guide was amazing in that he talked enthusiastically and almost continuously for the whole 11-hour day. He seemed to know everything about Death Valley including the wildlife, plants and geology. Besides the geography of Death Valley, he also taught us about American History e.g. California Gold Rush and about the history of Las Vegas. There were a few surprise stops at interesting locations not in the Viator Death Valley itinerary e.g. the Amargosa Opera House and Hotel. Amargosa Opera House and Hotel is a historic building and cultural center located in Death Valley Junction, in eastern Inyo County, California near Death Valley National Park. Resident artist Marta Becket staged dance and mime shows there from the late 1960s until her final show in February 2012. 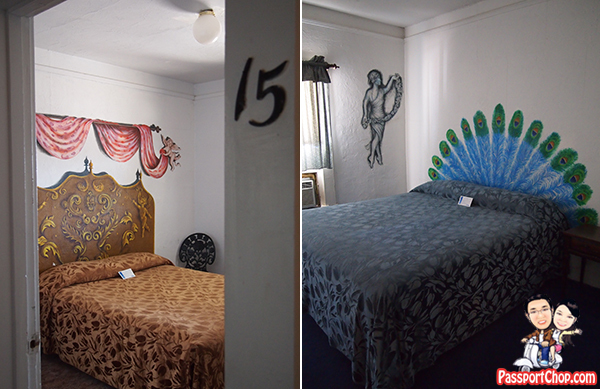 Several of the guest rooms have murals painted on the walls where cherubs and peacocks and angels frolic. The hotel is rumoured to be haunted especially room 15 as seen in the picture below. 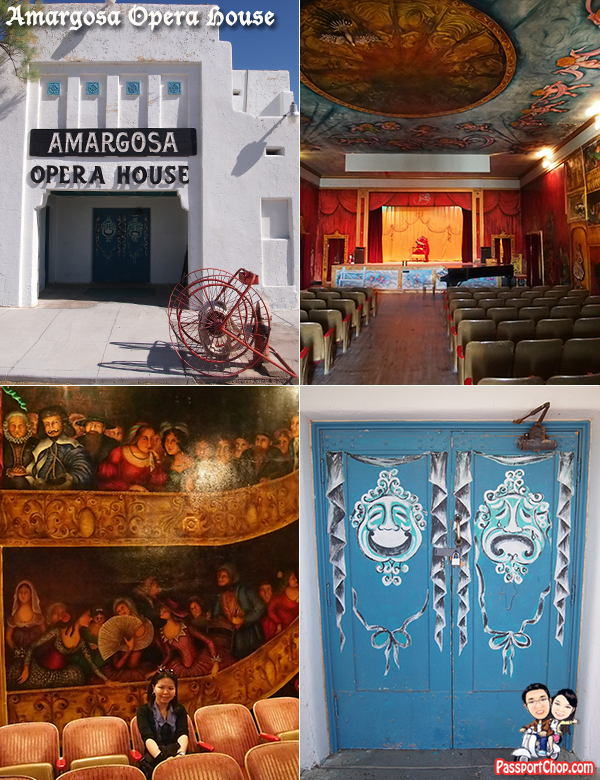 Besides the hotel rooms, the Amargosa Opera House is also painted with lots of murals. In July 1968, Marta began what would become years of painstaking work, painting an entire audience on the walls, filled with characters who might have attended an opera back in the 16th century. From the King and Queen, to royalty, nobility, bullfighters, monks and nuns, the walls came to life. Inside the double doors she painted a lady dancing to an accompaniment provided by a musician playing an antique musical instrument. More characters from out of the past spilled onto the walls from her imagination, from ladies of the night to gypsies; from revelers to a group of royal children tended by a governess who is being courted by a gentleman seated in the balcony above. American Indians discovered by the Spanish in the early 16th century grace the walls at the bottom, performing various feats of skill and chance for the entertainment of the King and Queen. Upon these walls Marta has created a world of the past. To complete her world she painted a marble statue in the center of the West wall. It took four years to complete these murals. Another surprise stopover was at some talc dunes right after we formally drive into Death Valley National Park. See the middle picture below – these looked like sand dunes but are actually talc – like talcum powder (or baby powder) – these are very soft small grains of talc. These places looked just like places out of Star Wars – the places where Luke SkyWalker grew up. These areas are also known as the Badlands as these are convenient places for bandits and bad guys to hide from sheriffs back in the days of the Wild West and also good places to ambush unsuspecting passerbys due to the unadulating land which provided a lot of cover and hiding places – thus these type of land/terrain is for the bad guys! Back onto the Viator Death Valley Tour from Las Vegas itinerary, we drove to the Devil’s Golf Course – so named because of the jagged edges of the rocks (see picture below) and coupled with the numerous holes in these rocks. 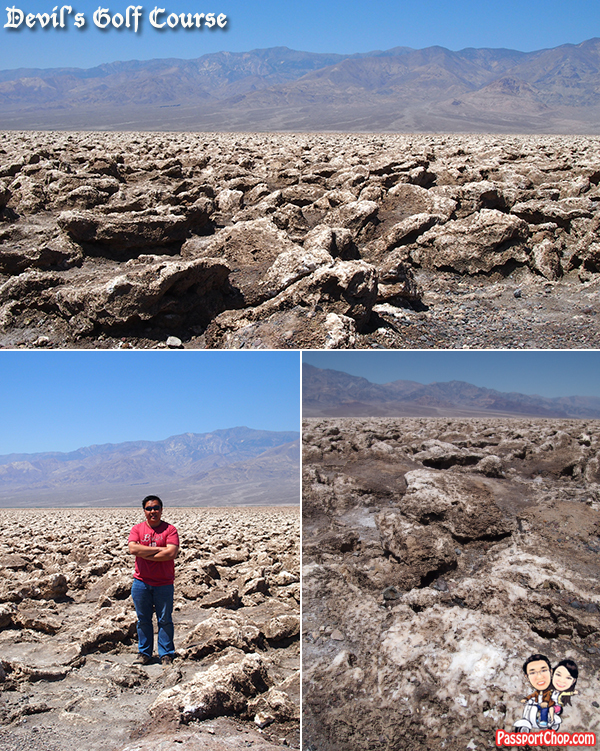 The Devil’s Golf Course is a large salt pan on the floor of Death Valley, located in the Mojave Desert within Death Valley National Park. It was named after a line in the 1934 National Park Service guide book to Death Valley National Monument, which stated that “Only the devil could play golf” on its surface, due to a rough texture from the large halite salt crystal formations. A lake (Lake Manly) once covered the valley to a depth of 30 feet (9.1 m). The salt in the Devil’s Golf Course consists of the minerals that were dissolved in the lake’s water and left behind in the Badwater Basin as the lake evaporated. With an elevation several feet above the valley floor at Badwater, the Devil’s Golf Course remains dry, allowing weathering processes to sculpt the salt there into complicated forms like those you see in the picture below. 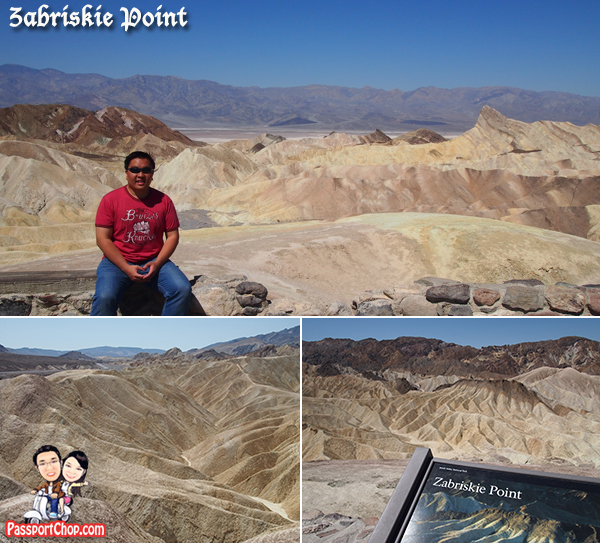 Zabriskie Point is a part of Amargosa Range located in east of Death Valley in Death Valley National Park in the United States noted for its erosional landscape. It is composed of sediments from Furnace Creek Lake, which dried up 5 million years ago — long before Death Valley came into existence. This is a great place for panaromic photos of the surrounding beautiful landscape. Next stop is Badwater, the lowest spot in the Western Hemisphere, at 282 feet (85 meters) below sea level, with a permanent spring-fed pool where you actually can walk on the salt flats. The site itself consists of a small spring-fed pool of “bad water” next to the road in a sink; the accumulated salts of the surrounding basin make it undrinkable, thus giving it the name. 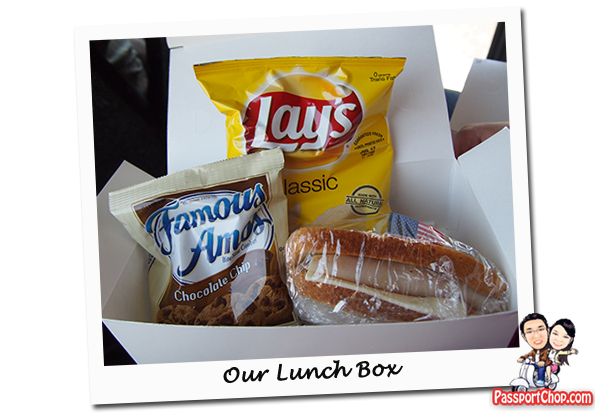 We had a complimentary boxed lunch on the road with a sumptuous treat of ham sandwich, potato chips and famous amos cookies. The minivan is equipped with a cooler filled with cold mineral water bottles and you are free to take any amount you want – in fact, you are encouraged to take as many as you can in view of the hot weather in Death Valley. Then it’s on to Scotty’s Castle, where a castle guide will take you back in time with interesting stories behind the founders of these castles and their unique and interesting relationship. This is unlike any European castle we have seen but the decor is just as luxurious – but the highlights of the tour is really to hear the story behind Scotty and his business partner and how this castle came into place. Now this castle is manned by the US National Parks authority. 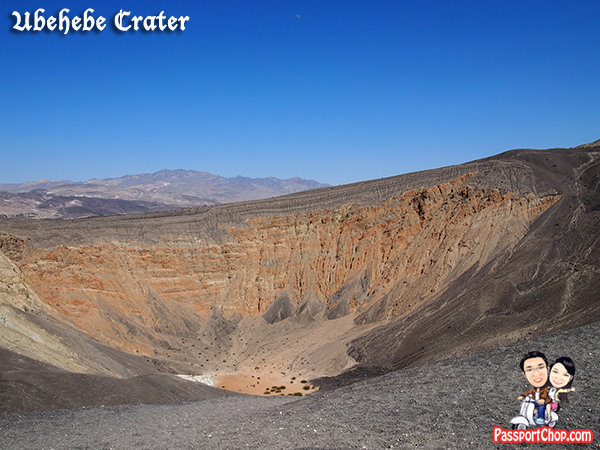 After Scotty’s Castle, we continued on to Ubehebe Crater. The crater is all that remains from a volcanic eruption that was so violent, the volcano itself was destroyed. This was our last stop – we were supposed to check out the Rhyolite Ghost Town but time ran out so had to skipped it. All in all – this USD 199.99 tour at http://www.partner.viator.com/en/11499/tours/Las-Vegas/Death-Valley-Day-Trip-from-Las-Vegas/d684-3153DTHVALLEY is great value for money – you get to see the highlights of Death Valley’s interesting geological formations and the Scotty’s Castle with Ralph – the tour guide who is always eager to share his stories of Death Valley geology and USA’s history and pretty much everything. Before you start the Death Valley trip proper, Ralph will give the tour group an option – to proceed with the itinerary as stated on the Viator site (which includes Scotty’s Castle) or skip Scotty’s Castle and check out the scenic natural tour which will bring you to more natural geological sites in Death Valley (what you see above is only the tip of the iceberg). If you are lucky to be in a group who is open to skip the Castle and check out the natural route, I think it will be so much value for money. The tour (with the Scotty’s Castle included) is the default tour and as long as just one person indicated that he/she would like to see the Castle, the whole group will have to go on the tour with the Castle because it is what was advertised on the Viator site. Helpful information. Lucky me I stumbled upon your website unintentionally, and I’m shocked why this accident failed to came about ahead of time! I bookmarked it. I’ve been surfing on-line greater than 3 hours nowadays, yet I by no means discovered any interesting article like yours. Itˇs lovely price sufficient for me. In my view, if all web owners and bloggers made just right content as you did, the internet will likely be a lot more useful than ever before. I absolutely love your blog and find a lot of your post’s to be psreiecly what I’m looking for. can you offer guest writers to write content for you personally? I wouldn’t mind creating a post or elaborating on most of the subjects you write regarding here. Again, awesome site! I needed refresh that page times to look at this page for reasons uknown, however, the knowledge here was initially worth that wait. I precisely had to appreciate you once again. I’m not certain the things I could possibly have achieved in the absence of the type of strategies revealed by you regarding this area of interest. Previously it was the difficult problem for me, but spending time with the well-written manner you managed that made me to leap over joy. Extremely happy for your assistance and thus hope that you comprehend what a great job you’re putting in educating most people by way of your web page. Most likely you haven’t come across any of us. In just $199 so much you had.. wow, It’s quite affordable , compared to the cost of Asian locations! That’s simply Great! Opera is the most classic play on thearte. I’m very delighted to be able to see the best opera from other countries in Bangkok. I wish to see more of them in the near future. Wow, for just 199 USD! That’s an amazing opportunity. 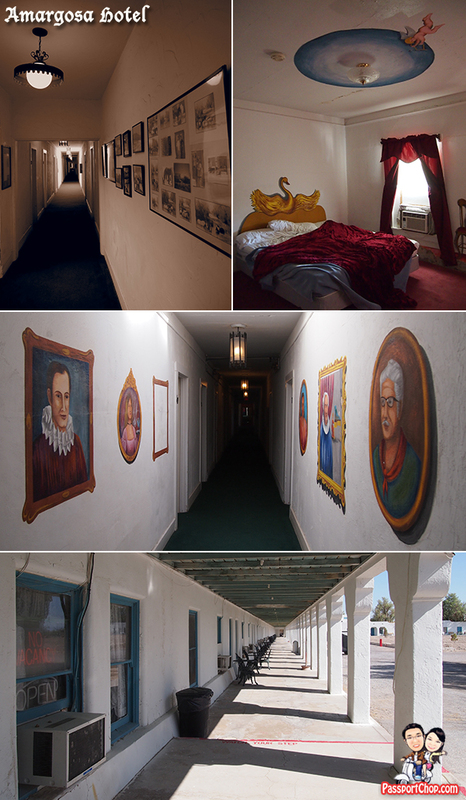 By any chance, were you able to see any Ghosts in Amargosa? the theme/design), I don’t have time to look over it all at the minute but I have bookmarked it and also added your RSS feeds, so when I have time I will be back to read a lot more, Please do keep up the excellent work. It is rather great you just read your content, my pal. And i should focus on your blog post on a regular basis and even view your web page you just read ones most recent posts, at the time you update. Keep up! We do hope you have a very good day. 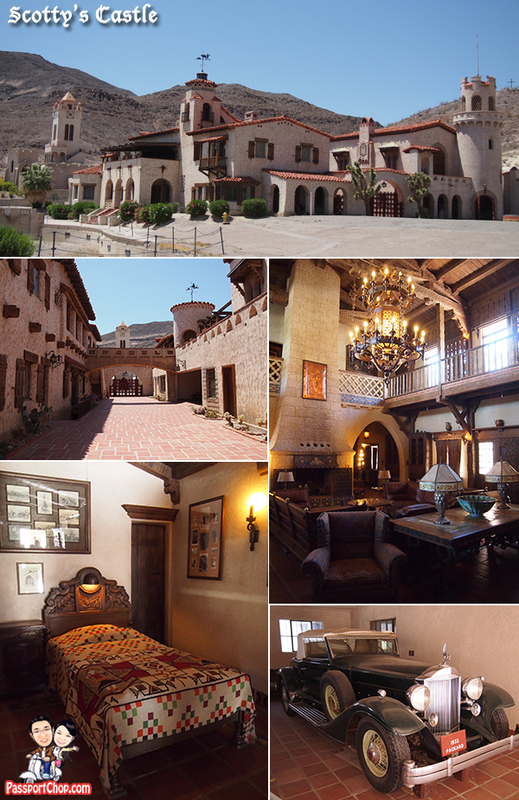 Seeing the photos od Scotty’s Castle, it must really feel good to visit the place. The interesting story behind the founder makes me more enthusiastic to be at the place. The world hopes for even more passionate writers such as you who aren’t afraid to mention how they believe. Always go after your heart. You¡¯re actually a just right webmaster. The website loading speed is incredible. It sort of feels that you¡¯re doing any distinctive trick. Also, The contents are masterwork. you have done a magnificent activity in this topic! Your article has some of the best content I¡¯ve read on this topic lately. You¡¯re viewpoints are really right on in my opinion. Thank you. Keep up the good writing. Thanks so much for giving everyone remarkably marvellous chance to read critical reviews from this site. It is always very brilliant and also stuffed with fun for me personally and my office mates to search the blog on the least three times a week to read the latest things you have. And lastly, I’m always fascinated with your exceptional ideas you serve. Selected two points in this post are surely the most beneficial we’ve had. I wanted to write a quick comment in order to express gratitude to you for all of the nice guides you are writing here. My extended internet look up has at the end been compensated with really good points to exchange with my close friends. I would assume that most of us website visitors are undeniably blessed to dwell in a fabulous website with very many awesome individuals with very helpful suggestions. I feel very fortunate to have come across your webpage and look forward to some more brilliant moments reading here. Thank you once more for a lot of things. I am just commenting to let you be aware of what a brilliant experience my friend’s child encountered visiting yuor web blog. She realized lots of issues. hello! I just want to give an enormous thanks for the good article you’ve got here on this post. I shall be coming back to your site later. Thank you very much for the post and nice pictures! Hey very cool blog!! Man .. Excellent .. Amazing .. I’ll bookmark your blog and take the feeds also…I am happy to find numerous useful information here in the post, we need develop more strategies in this regard, thanks for sharing. . . . . .
create the sort of fantastic informative web site.